The 2015 PHL Congress needed only 3 days in Rome to bullet “Deliver moisture testing to growers.” Soon after, Dr. Dirk Maier moderated the “Drying and Storage” breakout which entertained comments about how impractical staple grain storage is without moisture testing. Also mentioned were the differences between the science standards and protocol practices used to calibrate moisture meters. Calibrations that do not standardize may reduce the meaning of approaches and intervention strategies to reduce mycotoxins and other PHL. African Regional Standards Organization supports Ghana Standards Authority (GSA) to standardize handheld and other moisture testers and meet a “Statutory mandate to verify and calibrate all weighing and measurement instruments used for trade in Ghana” and so, “All warehouses involved in the Warehouse Receipt System (WRS) must use moisture meters to determine the moisture content and weighing instruments to establish the weight of maize before receiving into the facility. These instruments should be calibrated first prior to being used for this trading activity” (Crentils, 2013). Northern Ghana welcomes various moisture meters from many donor production packages. However, production package testimonials rarely mention calibrated moisture meters and so the results of many various tests may not have meaning to growers. The multimillion production packages include WRS that “even if they did work, they would not help smallholders, which they are often claimed to do” (World Bank/Ferris, 2013.) Due diligence and barrier analysis by small business suggest that WRS practice protocol more often than standards (Lanier, 2015). at harvest approaches to support standards that help growers navigate WRS protocol? market interventions that discount WRS protocol and add meaning to standards? “Behavior Change Strategy” (Kenny, 2015) to help WRS adopt standards? 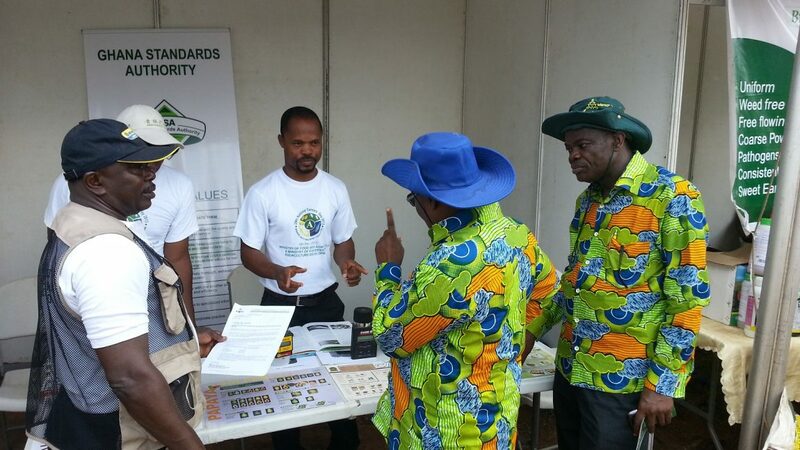 One approach to reduce PHL with moisture testing, was scaled up in August 2013 when “Diana’s Moisture testing and Solarization” (MT&S) business began providing the Ashanti region of Ghana with GSA calibrated moisture testing. Moisture testing extends beyond food grain, because purchasing seed with correct moisture levels reduces poor germination tests later. Diana is ready to travel to fields being harvested by mechanical combines and test for moisture problems. 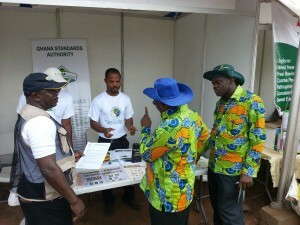 GSA calibration has been presented by Diana’s MT&S at National Farmer’s Day celebrations (MoFA). Anyone using the large cup screw on lid type meters to test and market bags or sacks will appreciate the probe type Armstrong PHL meter that is “an easy, low-cost method to measure moisture of several different grains stored in bags” (McNeill, 2015). Given that moisture meters and standards already exist, why are they not adding meaning to production and changing the game by “having a large, positive and immediate impact in mitigating mycotoxin problems” (McNeill, 2015) and “empower women [like Diana] in their roles, reduce PHL, and improve the well-being of their families” (Kenney, 2015)? Crentils, G., 2013. Letter to Minister of Crops [GSA/MED 114.14/V.4/40, 2013-09-12] Ghana Standards Authority Moisture testing lab, Accra, Ghana. Kenney, G., (September 2015). Women and Postharvest Loss [PHL Community of Practice Blog post]. Retrieved: <http://publish.illinois.edu/phlinstitute>. Cernansky, R (October 2015). A Silent Scourge Is Wiping Out Crops in Africa. [takepart World Series] Retrieved: <https://www.takepart.com/article/2015/10/5/reducing-post-harvest-food-loss-africa?>. Lanier, Salifu, Parker (2015). A Qualitative Discussion about the Utility of Staple Grain Logistical Platforms in Ghana, West Africa [ADM Congress Presentation]. Retrieved <http://phlcongress.illinois.edu>. McNeill, Armstrong, Osekre (2015). 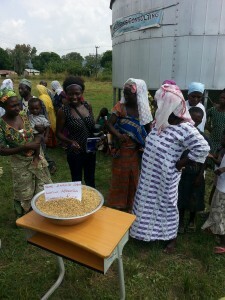 Assessment of Moisture Measurement and Maize Dryers in Ghana [ADM Congress Presentation]. Retrieved <http://phlcongress.illinois.edu>. World Bank/Ferris, S., (2013). Postharvest Loss: The Case of Missing Food in Sub-Saharan Africa [Text box 3.5]. Retrieved <www.fao.org/ag/ags/ags-division/publications/publication/en/c/81559/>. Hello William – thankyou for these insights into your experiences with managing grain losses in African food systems. The high level principle that emerges for me from what you have written is how critical measurement is to attempts to make improvement in a food system – only when you have gathered information on changes in performance associated with changes in practice do you have a robust basis for continual improvement, the key to long term and stable reductions in levels of postharvest losses. Quantitative data are absolutely central to postharvest innovation. Is “inherently hard” for Wet or Dry PHL? At a humble level, moisture testing and storing Dry is not rocket science and easy compared to Wet PHL. Yet the clamoring to be the highest level visionary seems to delay easy solutions that could release resources to solve Wet PHL?